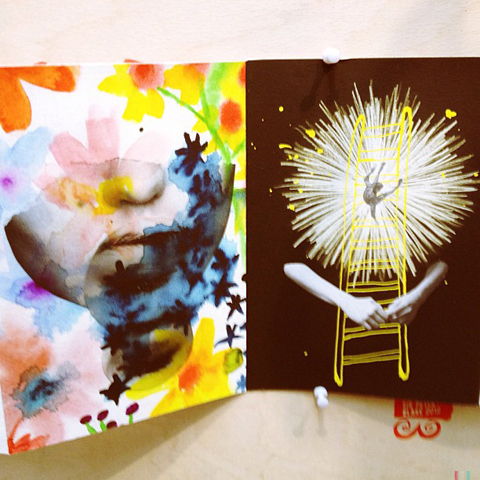 This year the D&AD New Blood graduate show was held once again in a cordoned off section of Spitalfields Market. It’s a small space with hoards of exhibiting students crammed into the tight corridors, which can make it hard to manoeuvre around when it’s busy. Most colleges had as usual opted for a simple display on plain white stands, but one in particular had pushed the boat out: Southampton Solent had hand stamped the brown boards of their Wooly Bully Illustration show stand, providing an excellent foil to large scale screen printed work, handmade badges and a high quality promotional package. Amongst a sea of stands featuring A2 printed copies of students work this was a delightfully visceral experience. 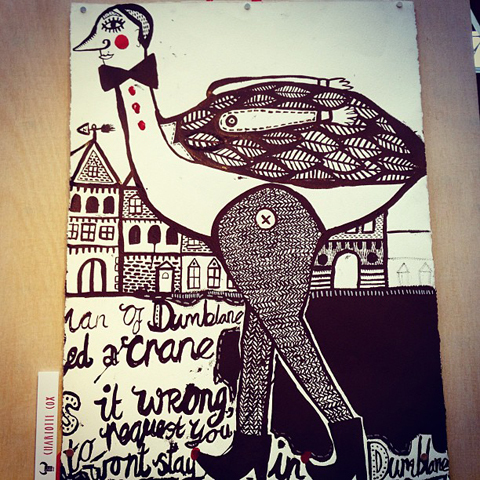 One of my favourite pieces was the bird man above by Charlotte Cox. They were also handing out invites to their stand alone London show, Solstice, at the Coningsby Gallery, but I was sadly away when it took place: I hope I’ll get an earlier invite next year! 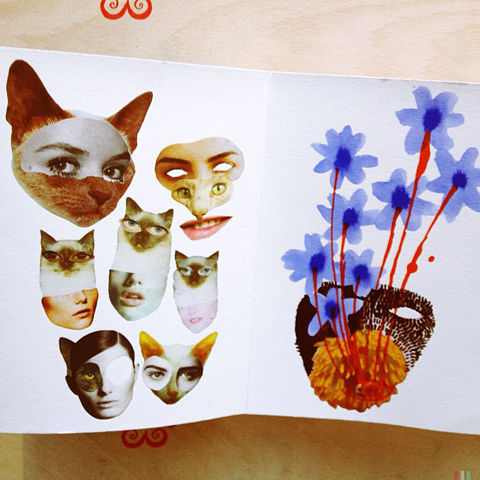 These images are from a book that was hanging on the wall, illustrator unknown. 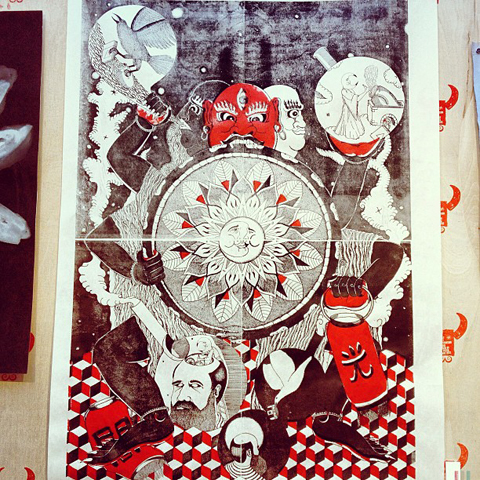 This screenprint titled Rotam Vitea features alchemical symbolism and is by the enigmatically named Rake. 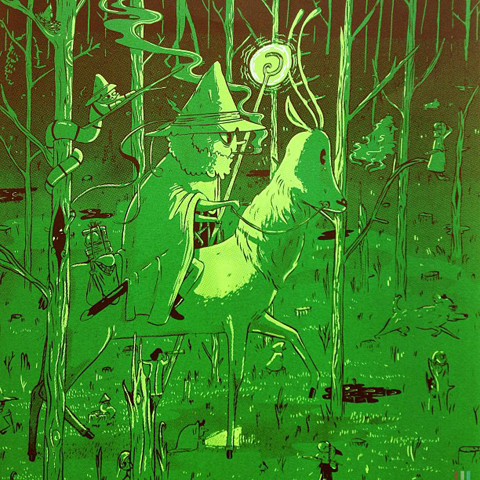 And from the rest of the show, here’s the illustrations and design work that caught my eye: Elliot Kruszynski at Bath Spa University wants us to Save the Forests and the Animals and the Wizards with this wonderful atmospheric print. 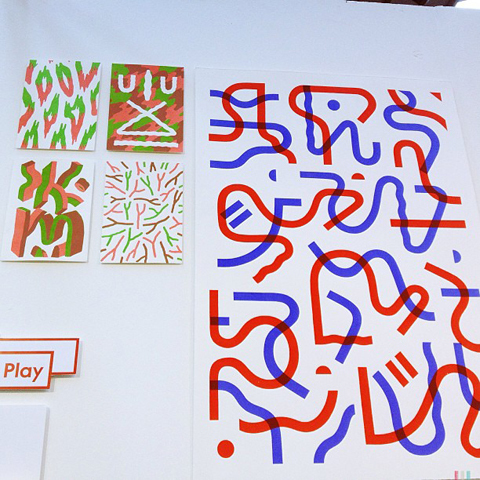 I didn’t get an invite to the Westminster University standalone degree show this year, which is a shame as on the strength of their small New Blood display it looks like this was a particularly talented group. 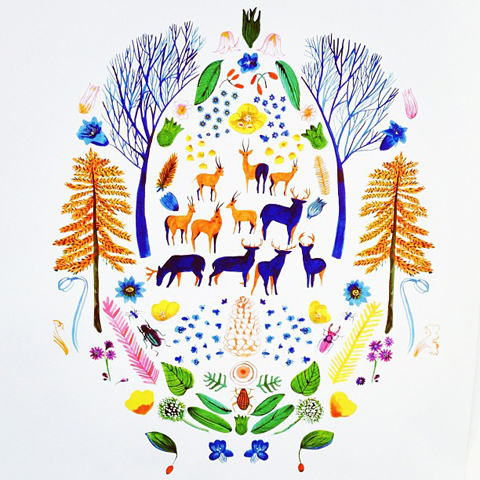 This beautiful illustration is based on an Austrian folk tale, by Carina Dewhurst. 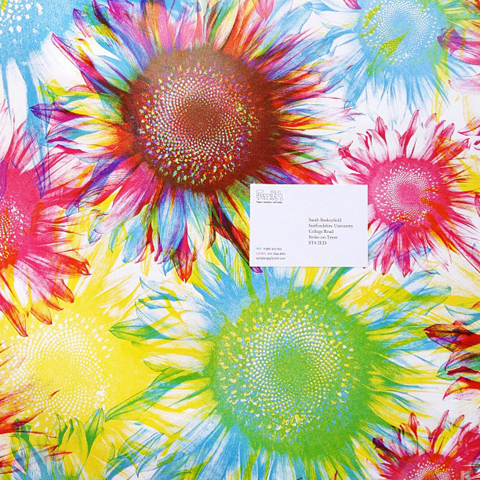 This gorgeous abstract artwork is by Louise Byrnes, who also created textile designs that reminded me of the trend for splashy abstracts that was very prevalent at New Designers. 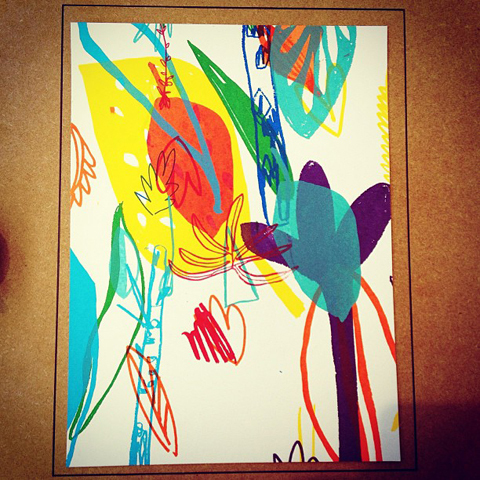 Just lush, so lush in fact that someone tried to make off with the very print shown above whilst I was there! 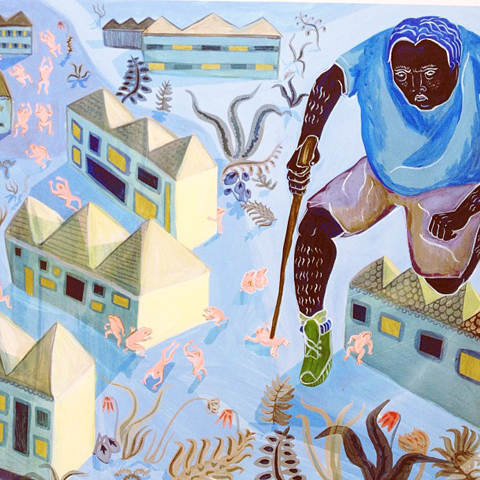 Carmen Lynch was inspired by environmental disasters to create this threatening yet engaging image. 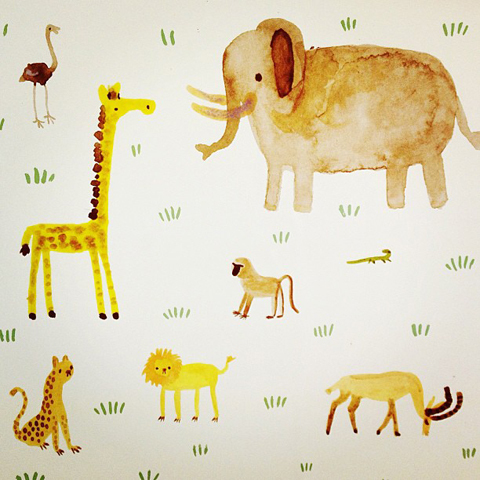 These cute animals are by someone at UCLAN – unfortunately I didn’t note who as there were no labels. Then the artist responsible tweeted me, but I failed to to take a note of her name then. If it’s you, let me know! 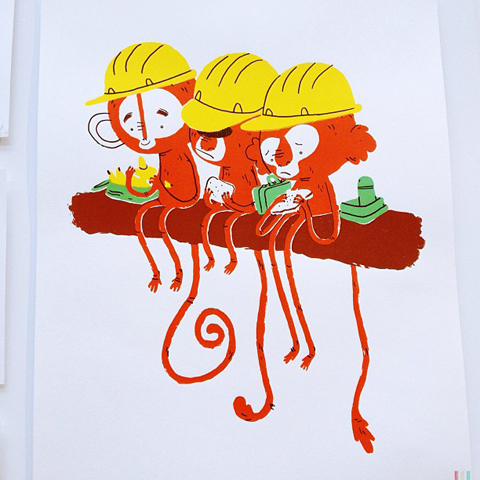 Lunchtime Atop a Tree features a trio of monkeys, by Rhiannon Izard, a paper artist and illustrator from Plymouth University. 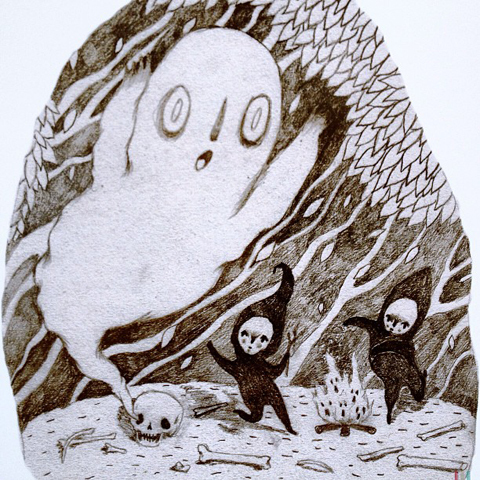 Sophia Viney goes under the name Littleinkstain – I like her ghost, which is part of a story about a dark forest inhabited by pixies, created for the BimbaGirls Comic Anthology. 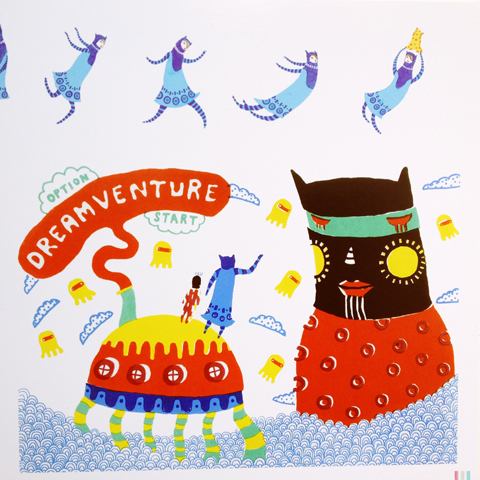 Saif Chowdhury‘s fantastical characters are inspired by Japanese video games and bizarre worlds – this image was created for a story about a child on a quest to find their dead father, whilst overcoming monsters and obstacles. 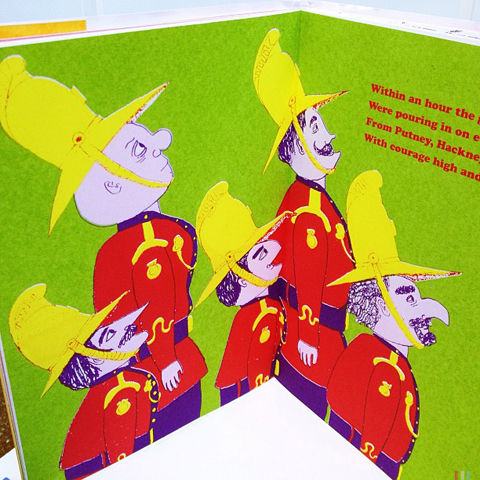 This colourful children’s book by Lucy Wooler at Norwich University was inspired by a Victorian morality tale. 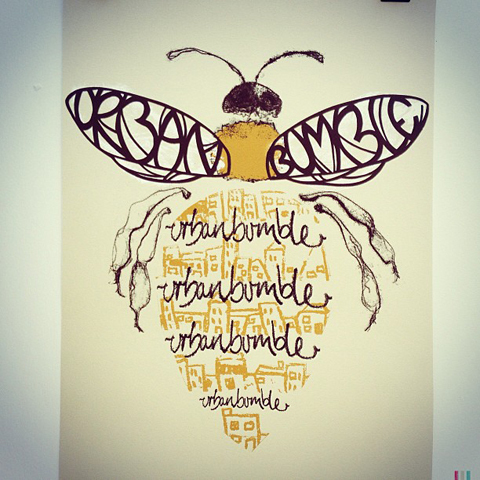 Behold, a humble bumble bee made of type by Tori Gray at the University of Dundee. 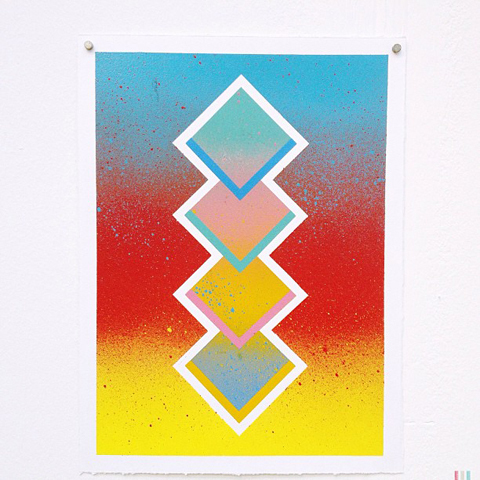 Marco Galloway researched colour theory to make this great abstract illustration. 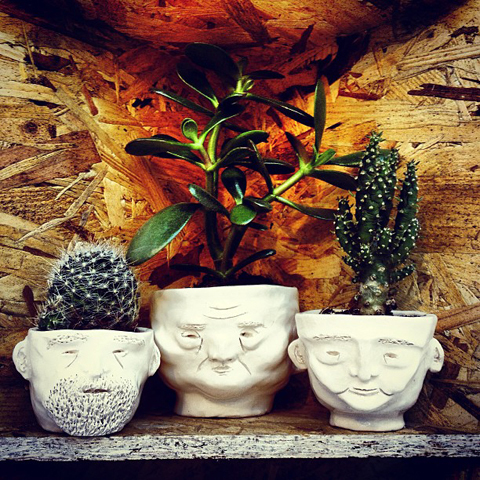 These ceramics by Danielle Smith were inspired by mysterious tales of the traveller community. 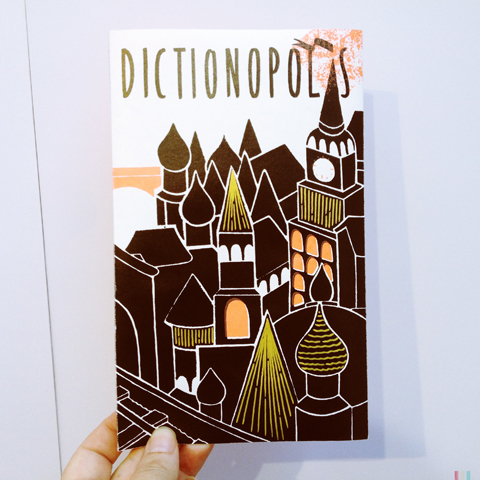 Dictionopolis tells the tale of a city of words: this beautiful hand printed concertina book by Jamie Wilson of Northumbria University simply took my breath away. 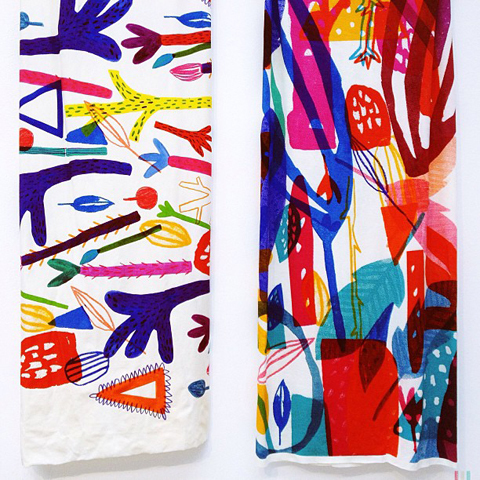 I wasn’t sure where to find him online, since Jamie Wilson is apparently quite a common name for an illustrator. This seems most likely to be his home though. 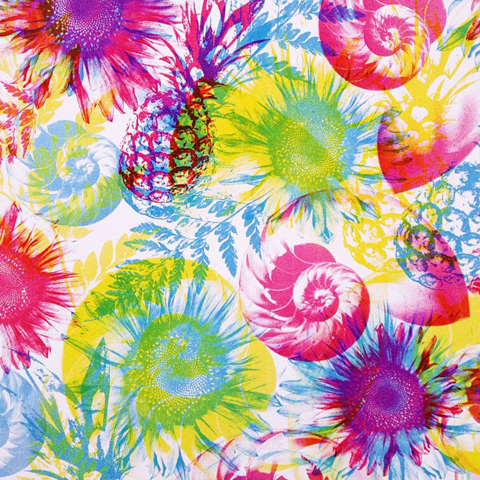 These hyper colour flower, fruit and shell printed patterns are by Sarah Baskeyfield at Staffordshire University, and were standout pretty amongst all the angular graphic designs on show. 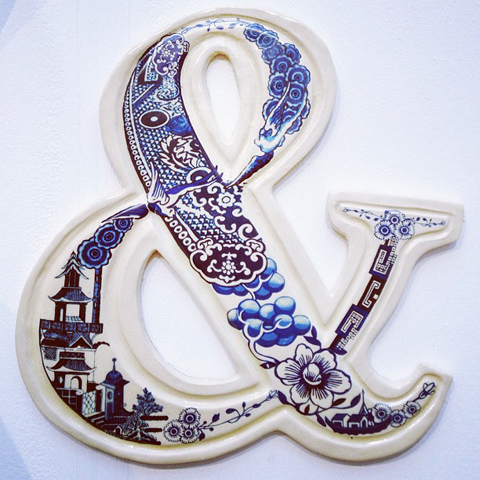 This giant pottery ampersand by Helen Player was created as part of a design brief for the V&A. Dominic Kesterton at Edinburgh College of Art based these designs on the linguistics of a fictional seaweed picking culture. 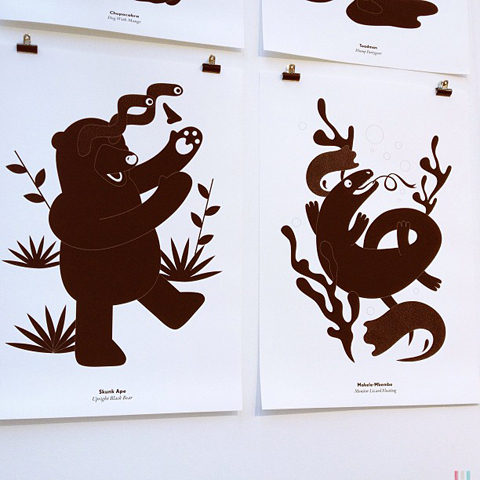 Lastly these brilliant black characters are by Alex Tait at Bucks New University. 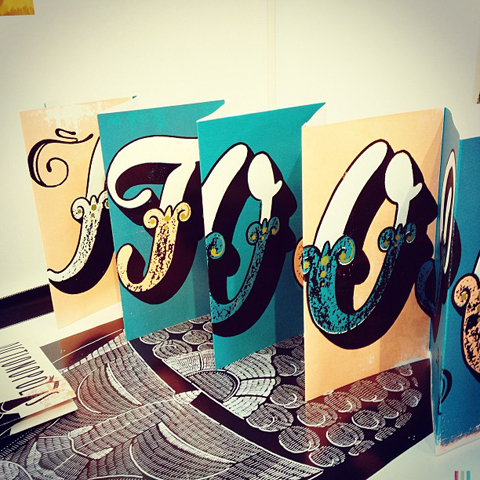 There were lots of other interesting things on show, but I’ve been writing (or am still writing) stand alone reviews about a number of illustration degrees, so you’ll find their best work elsewhere on my site.